Something strange is happening in the city of Everett, Washington and Father Niccolo Paladina is tasked with investigating possible demonic activity. Nothing is as it seems, however, and things quickly begin spiralling out of his control. When his path crosses with that of an old rival, they discover that things are worse in Everett than either of them could ever have imagined. As his world collapses around him, Niccolo will be left with one terrible question: what is my faith worth? Will Niccolo be able to answer the question of his faith in the midst of this personal storm? Lincoln Cole, author of ‘The Everett Exorcism’ has joined me today to ponder demons, faith and Niccolo’s fate. Lincoln thanks for sitting down with me today. Now that we’re both comfy, take us through how ‘The Everett Exorcism’ came to life? The Everett Exorcism is a prequel to another series I wrote called the World on Fire series. I wanted to go back and give more depth to one of the favourite characters from that series and create a much larger world. How did the characters manifest themselves into this larger world? Arthur was actually the first character I wrote about in all of my books in this series. He existed before Abigail or Haatim. Father Niccolo Paladina came about during Raven’s Rise and it turned out he had a background with Arthur from years earlier. I just wanted to tell that story. What was important about the story that you wanted to tell? I wanted to create a story that was filled with horror, but also character growth, and to set up things that are coming later in the series while still telling a complete story. My biggest goal, though, was to send shivers up the spine of my readers. *Laughs* That’s an awesome goal. I won’t ask if you think you achieved it because we might reduce the number of shivering spines! Other than enticing shivers in readers around the world, where did you find satisfaction from creating this tale of horror? Being able to try new things when releasing it. For me, I just have fun putting the stories together, so getting a chance to try and find new readers and branch out with my style has been really rewarding. Have you thought about which branches of writing you want to climb to next in your adventure? Next, I’ll be finishing up this series by early 2018, and then turning to my Graveyard of Empires series. That one is a space opera with a lot of moving parts, but the next entry into that world will be a horror thriller set in space. Enjoy your trips to space! Is that love of exploring the unexplored what keeps driving you back to the keyboard to tap away another tale? I can’t not write. I just love to tell stories and since it’s something I do for a hobby instead of as a career I can just do my own thing and have fun with it. If it stopped being fun, I’d probably stop doing it. Do you have fun writing on a daily basis? I try to set daily goals and keep working on projects, but sometimes it’s hard with real life getting in the way. Real life can be troublesome like that at times! Does having a clear end objective or outline help you centre your focus on the writing in the scraps of time that you manage to carve into the day? Sometimes I know how a book is going to end, but more often than not everything turns out differently than I would expect. Sometimes I don’t see twists and turns coming in a story until they actually happen. Because of all of unexpected twists and turns, do you find yourself heavily involved in the editing process? I used to do the editing myself, but at a certain point it became too much work and it was too hard. I ended up hiring an editor who is amazing and helps clean up the work to make it presentable. Do you feel that you’ve made your work more presentable by just continuing to write? I’ve been able to focus a little bit better at keeping a story moving, and I’ve also developed more into my own style of short and punchy writing. I try not to get too wordy. Have you taken that short and punchy style and applied it to your own author brand, or used this philosophy to tailor what you write? I’ve worked on creating my own brand, but not focused solely on one genre or idea. I just want to tell fun stories and bring in new readers. I’ve also worked on offering resources for authors who are new to the industry to find their way. Can you share a little taste of your personal recommendations to help authors navigate the complex sea of self-publishing? Try Kindle Scout. Don’t be afraid to promote and market. Have fun. My website has special sections for author resources and tools and I write extensively about my process as an author. I’m very glad you believe in having fun! Me too! Let’s inject a little fun in our musings today by extending our focus beyond words and writing. Let’s firstly focus on being scared. What happens when you get scared half to death twice? Why is lemon juice made with artificial flavour, and dishwashing liquid made with real lemons? *Laughs* I’m not sure it’s on the same magnitude of many of those conspiracy theories, but it certainly does provide a viable answer to the question. If you ate pasta and antipasto, would you still be hungry? If you’re in a vehicle going the speed of light, what happens when you turn on the headlights? Ooooh, that sounds messy! What is your zodiac sign? What happens if Batman gets bitten by a vampire? Is that awesomeness for Batman, the vampire, or both of them? Are you left or right handed? *Laughs* I thought so! What is your best tip for authors? Yep, the world needs more books! What is your favourite word? I love the bubbly frame of mind. Are you able to keep that frame of mind to round out our interview today by sharing the most effervescent line from ‘The Everett Exorcism’? What is anyone’s faith worth? That’s a question that might take an entire series to answer! Unfortunately we don’t have enough time today to go through the entire series, but I wish you luck pondering the value of Niccolo’s faith and the fallout of this through the rest of the ‘World of Shadows’ series. Excited to read the book we discussed today? Find it here on Amazon: ‘The Everett Exorcism ( ASIN: B074DXKXCF )‘. 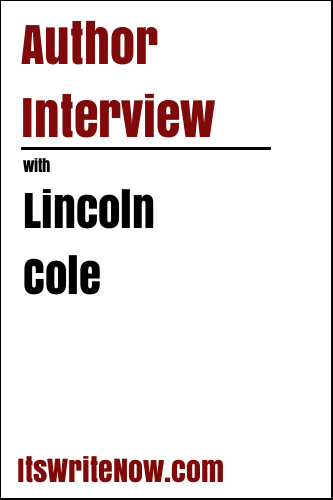 Want to find out more about Lincoln Cole? Connect here!